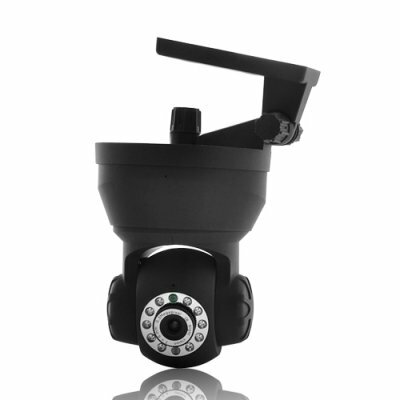 Successfully Added Wired / Wireless IP Surveillance Camera (IR Cut-Off Filter, Angle Control, Motion Detection) to your Shopping Cart. The ultimate wireless and wired IP security camera that comes with IR filter and motion detection alarm recording function has arrived. Monitor and record from anywhere in the world. Are you worried about security? Then we have found the perfect peace of mind gadget available in the market today. This is an IP security camera that has it all. IR filter, night vision, email alert, motion detection, quad screen viewing, tilt and maneuvering functions with a click of the mouse. You can set up to 4 IP cameras and give each a static IP, then go online from anywhere in the world by visiting the IP address and login to start monitoring. Provided with an advanced IR filter this IP surveillance camera delivers great clarity and image quality. Indeed infrared (IR) cut-off filters are used with our CMOS imagers to produce accurate color images. With the help of this technology every detail appears so distinctly thus allowing you to easily identify people and recognize objects, even in environments with very poor lighting conditions. Once you are logged in, you can manage an array of functions and change, modify, implement, view, and do so much more than just sit and watch. This model provides true versatility in its applications with WiFi enabled and the additional option that allows this smart IP camera to alert you via email when the motion detection record function is activated. Whether you're at an airport or a coffee shop, or you’re in Hong Kong, Paris, London, Barcelona, California, Moscow etc, you’ll be able to check the security status of your home or business from any computer in the world that has an internet connection. The Wi-Fi feature on this global security camera with motion detection recording comes with a CMOS 1/4 inch sensor for providing you with a high quality image for over the web viewing and supports TCP/IP, DHCP, SMTP, TP, DDNS, UPNP and PPPoE network protocols. Thanks to the night vision capability you can monitor and view your home or office any time, 24/7. The Wi-Fi feature comes with WEP encrypted security options, this helps in making sure your IP security camera system is protected from hackers. You can be at your office, Starbucks, or pretty much anywhere and still have full control of your security system to see what is going on at home. You can now truly say that you've got eyes at the back of your head. This powerful smart IP security camera with IR filter, night vision and motion detection recording is in stock now, and available to you at a factory wholesale price. Click "add to cart" now and we will express ship out your order tomorrow. Good for dropship sales as well as internet storefronts. Setup 4 cameras, and monitor different rooms. Records audio and video, so listen to what they are saying even if they are hiding from the camera. Yes It does, after you install the IP camera, log onto the admin panel and select the sensitivity option that best suits your needs. It is recommended that you test each sensitivity option as to best determine what it should be for your given need.